Georgia Red Clay? No Problem! Ceramic Tile? Like New Again! All of our products have been formulated to insure quality and effectiveness for each service. National Rug Cleaners has been providing residential and commercial services for almost a decade--and have spent a lot of time developing and using special processes to clean upholstery, Oriental rugs and ceramic tile. 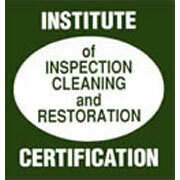 We are IICRC Certified and DuPont Stain Master Certified. All of National Rug Cleaners products are non-toxic, environmentally friendly, biodegradable, pet friendly and highly effective. We realize that our success is determined by our customers. Therefore--National Rug Cleaners is not satisfied until you are satisfied! Honesty, old-fashioned workmanship, expertise, certification, quality of care and service is what you may expect and will receive from National Rug Cleaners, Inc. Thank you for taking the time to browse our site-we look forward to hearing from you. National Rug Cleaners mission is to continue to provide an excellent level of service and cost effective pricing. National Rug Cleaners has been servicing metro Atlanta since 1997. We thank our customers for their loyalty-- we thank you for taking the time to browse our website and for considering National Rug Cleaners for your specific cleaning needs. National Rug Cleaners, Inc. is a second-generation family business originated in West Palm Beach, FL in 1980. In 1997, we expanded our business into the Atlanta, Georgia market. We have over 29 years of experience in the carpet cleaning industry. We have worked very hard to insure that we can offer our clients a 100% satisfaction guarantee. All of our cleaning products are specially formulated, tested and have been proven over and over again to insure the highest quality of cleanliness in the industry. We have a commitment to service, quality and a dedication to our customers. Our success is determined by the quality of our service and commitment that we offer to our customers. Being able to service you and build a customer relationship with you is what determines our success. We would like for you to be a customer of ours! National Rug Cleaners, Inc., based in Atlanta, is a Georgia Corporation licensed and insured. We are also IICRC (Institute of Inspection and Cleaning and Restoration Certified) as well as being Dupont Stainmaster Certified. National Rug Cleaners, Inc. has been in the business of commercial and residential carpet and upholstery cleaning for over twenty-two years. During these years, we have found that there are several different methods for cleaning carpets and upholstery. Our extensive research has lead us to believe that the truck-mounted steam cleaning system is still the best and most widely recommended by all of the major carpet manufactures. Our "EXTREEM KLEEN" process has been specialized to leave our clients carpets and upholstery cleaner, fresher, and more resilient to rapid resoiling. Several of our clients such as Chick-fil-A, Hennessy Lexus, The Darden Group, (Olive Garden and Red Lobster), Provinos, Scalini's, Grady's American Grill and Ryan's Family Steakhouse have been extremely satisfied with our service. National Rug Cleaners, Inc. is committed to providing the best quality and customer care in the industry.